Understanding the hygroscopic response of aerosol droplets to changes in ambient humidity is a pivotal challenge in many diverse fields of aerosol science ranging from drug delivery and toxicology to climate science and cloud physics. For example, the size change of medicinal droplets upon entering a high humidity environment can influence where the active ingredient is deposited within the human respiratory system, potentially affecting the efficacy of the treatment. Likewise, hygroscopic properties determine the cloud forming potential of atmospheric aerosols and therefore influence weather phenomena and the radiative balance of the Earth’s atmosphere. Current techniques for observing the hygroscopic behaviour of aerosols measure the change in size of particles as they pass through a humidity-controlled measurement space. Comparing individual measurements relies on the chemical composition, solute mass and other physical properties remaining constant from droplet to droplet. These assumptions lead to significant uncertainties in the measurement and introduce ambiguity when interpreting or predicting the properties of single particles. The Biral AOT-100 (Aerosol Optical Tweezers) is a new instrument which enables direct and continuous measurement of the hygroscopic behaviour of single aerosol droplets, and with a precision far beyond what is achievable with conventional techniques. 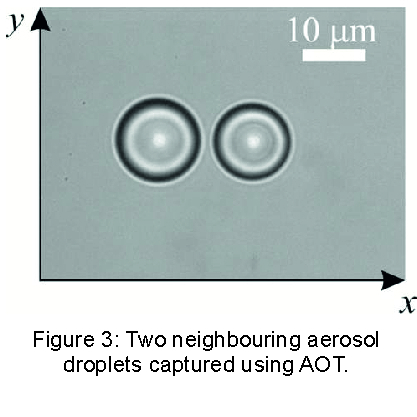 Individual aerosol droplets can be isolated and monitored in a tightly confined optical trap for periods of time extending from seconds to days or longer, if necessary. Trapped droplets are exposed to a controlled gas phase which allows the ambient humidity to be adjusted over the entire range from dry through to saturated conditions. Cavity enhanced Raman spectroscopy is used retrieve the size (nm precision), refractive index (0.05% precision) and chemical composition of a droplet-of-interest with a temporal resolution of 1s or better. In-situ analysis gives real-time information on the progress of an experiment. 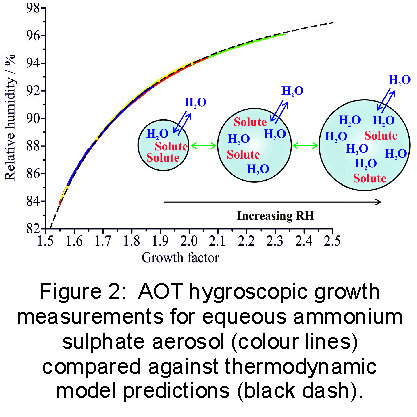 Figure 2 demonstrates how high precision hygroscopic growth curves, recorded using AOT, can be used to validate thermodynamic predictions, in this case for ammonium sulphate aerosol. In these measurements a neighbouring droplet has been used as a highly precise probe of the gas phase RH, as shown in Figure 3. Each growth curve is mapped from an individual droplet, avoiding the need to account for droplet-to-droplet variations which are unavoidable in conventional techniques. Recent measurements have made use of the AOT’s rapid RH control to resolve the kinetics of slow water transport in ultraviscous droplets at low RH. 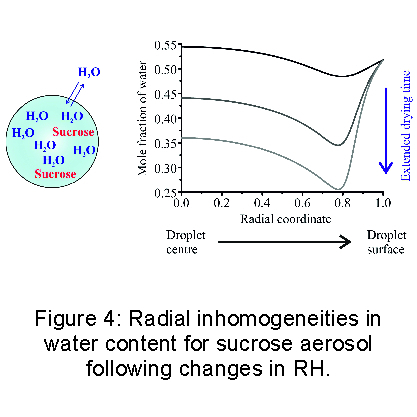 Figure 4 shows the radial inhomogeneities in water content resulting from an RH change about the glass transition for sucrose aerosol. The hysteresis of the system is shown to play an important role in determining the internal composition of the droplet. These types of measurements, providing insights into the properties of glassy and amorphous phases, have significant implications for atmospheric studies and would simply not be possible with conventional techniques. J.S. Walker et al., ‘A Direct Comparison of the Hygroscopic Properties of Ammonium Sulphate and Sodium Chloride Aerosol at Relative Humidities Approaching Saturation’, J. Phys. Chem. A 114 (2010) 12682–12691.